Many Americans consider curling to be one of the most unusual Olympic events. However, the sport is gaining in popularity every year. Curling is a cross between shuffleboard on ice and bowling. Many people think that the idea of watching a shuffleboard tournament is a bit of snore, but curling is strangely compelling. Once you start watching, it is hard to pull yourself away before the match is over. As more people become exposed to the game through watching the Olympic coverage, more people want to give it a try. Consequently, there are now curling clubs in every state. Curling is an ancient sport. It is believed to have originated in Scotland sometime before the 16th century. Curling has been an Olympic event off and on over the years. It was a full-fledged event in the first winter Olympics in 1924 and then was a demonstration sport 3 more times before becoming an official sport again in 1998 having spread throughout most of Europe, North America, Australia and Asia. The Olympic curling events take place over a series of round robin events. The tournament format is similar to the kind of rounds that we see in Basketball tournaments. Each game consists of ten “ends,” which are similar to sets in tennis or innings in baseball. In each end, each team member throws two stones. If there is a tie after the ten ends, game play continues until the tie is broken. Gameplay is typical reserved to 73 minutes per team for the ten ends with 2 timeouts. If extra ends are played, they are limited to 10 minutes per team with an extra time out. 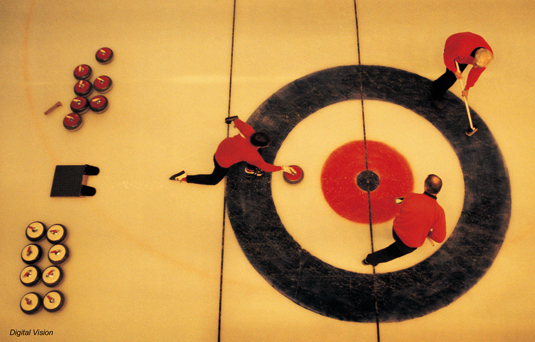 In curling, teams slide a polished granite stone over a rectangular sheet of ice. The ice sheet has a pattern on it (called the house). The goal is to place your team’s stones closer to the target than your competitors. To assist the stone in reaching its mark, teammates sweep the ice with brooms to guide the stone. The friction from the sweeping creates thin water tracks that the stone can follow. The Olympics and most international competitions, use only traditional Scottish curling stones. These granite stones (44 lbs each) are from Ailsa Craig a Scottish island. These ailsite stones have very low water absorption, which makes them ideal for the sport. The game requires a lot of skill, strategy, and finesse. Because of this it is often called “chess on ice”. The skip (essentially a team captain) decides where they want each stone to be placed to ensure that their team’s stones end up closest to the center of the bulls eye. Once they strategize they’ll stand near the target and place the broom handle at the point of the field that they want the person sliding the stone to aim for. The slider will begin at the hack (the back edge of the course). The slider will draw the stone back (sometimes they lift off the ice and sometimes not and then they swing the stone forward sliding themselves and the stone forward. The slider must release the stone before he crosses the first line. The skip then directs the other two teammates how to use their brooms to guide the stone. The ice sheet (145 x 15 feet) has to be created in specific conditions in order to obtain the correct playing surface. The surface must start off with a level field and then have water droplets sprayed on it so that it creates a pebbled surfaced. This surface helps to create the curl (or spin) of the stone after it is released.